"Patrols from 442nd here. We love them." That single, terse radio message conveyed all the happiness, all the gratitude 211 survivors of the "Lost Battalion" perceived when a band of squat warriors, Oriental-eyed and diminutive of foot, broke through to rip apart the German wall that had confined them for several days. Loving tribute of 141st men went to the Nisei. Though the message was of a more impulsive nature, it was at the same time indicative of the high regard in which the fighting ability of the Japanese American was held by infantrymen of the 36th Division. "We men who came off that hill know that the Nisei arent just as good as the average soldier--theyre better," was how one of the 141st lieutenants put it. In an unprecedented gesture of appreciation several months later the "Lost Battalion" survivors presented their rescuers with a silver plaque. The trophy was received by Col. C. W. Pence, commanding officer of the 442nd, on the Nisei regiments second anniversary of organization. Japanese-Americans of the 442nd Infantry pass through the main thoroughfare of newly-won Bruyeres. 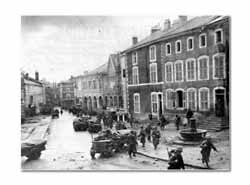 The 442nd was attached to the Division prior to the Bruyeres engagement, and played a major role in the capture of that town. The 1st Battalion of the 442nd, designated the 100th Battalion, was first tested in combat shortly after Salerno with the 34th Division. Later it was incorporated into a regiment with two other Japanese American battalions. Their slogan"Go For Broke," or its equivalent, "Shoot the Works."